Applying For Canadian Citizenship-Check Whether You Are Eligible! Planning to apply for the Canadian citizenship? Do you want to know the requirements and application procedure of the Canadian citizenship? If yes, this article is meant just for you. Immigration to Canada is the most popular option for the people aspiring to migrate overseas. Acquiring a Canadian Citizenship is a great privilege. It can bring in numerous benefits including the right to vote and a Canadian passport. Who is eligible to apply for Canadian Citizenship? All the eligible candidates are required to download and fill the forms in the Canadian Citizen Application Package. You are required to include all the required documents and pay the application fee to get your application processed timely. How to Prepare for the Citizenship Test? Applicants who are between 18 and 54 years of age need to take the citizenship test. The details regarding the time and date of the test will be provided by the Canadian immigration authorities upon receiving all the required documents. 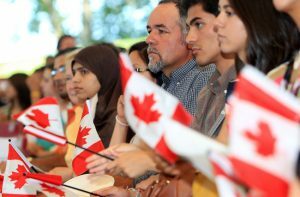 Upon submission of the required documents, the Citizenship and Immigration Canada will take 24 months to process the Canadian citizenship application. We hope you got the required information about the Canadian Citizenship. Now, the interested candidates can find it easy to apply for the Canadian Citizenship. I’m A Student Of The Higher Institute Of Management Studies,studying management.I’m Of Age 24 And A Cameroonian,and Willing 2 Apply 4 The Canadian Citezenship,while Waiting For Your Humble Reply,i Remain Your Sincere Applicant,thanks.